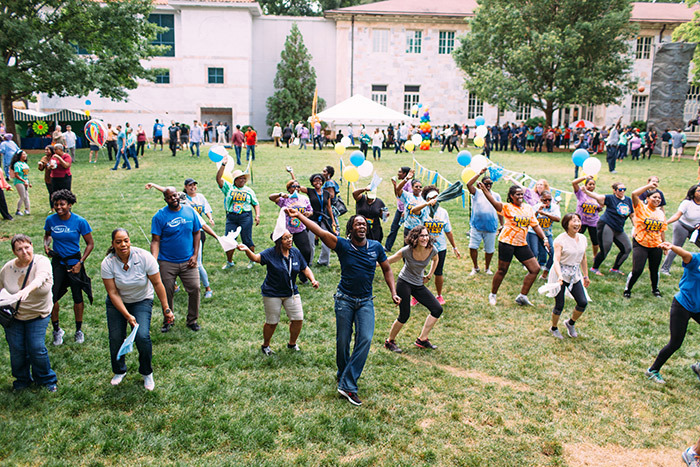 Staff Fest 2018 celebrated 40 years of fun and community camaraderie as revelers gathered on the Emory Quadrangle to acknowledge the work and support Emory staff members provide throughout the year. 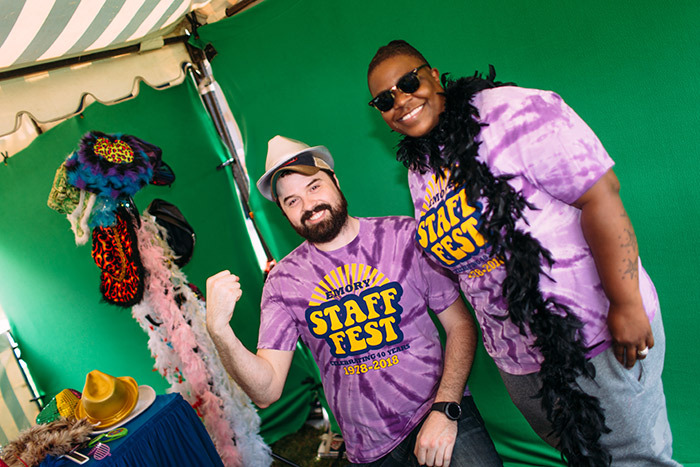 With tie-dyed t-shirts ablaze in groovy colors, this year’s Staff Fest featured a 1970s theme to mark the 40th anniversary of the festival, which has united Emory employees for an afternoon of food, music and games since 1978. 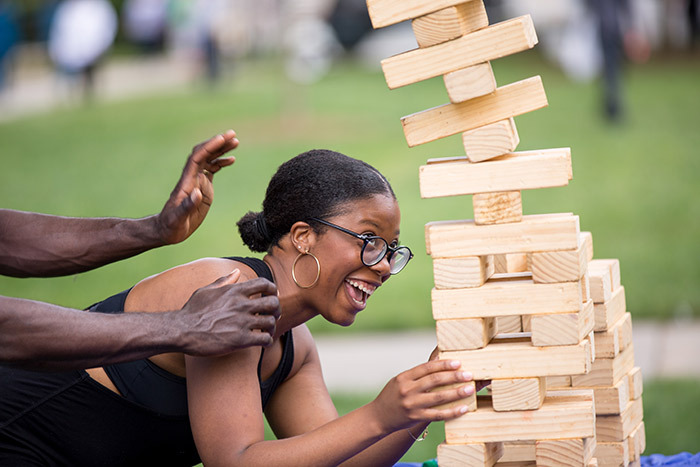 On one end of the quad, attendees settled inside tents and shady nooks to enjoy a barbecue luncheon catered by Jim ‘N Nicks, an assortment of beverages provided by Coca-Cola, popcorn and ice cream treats. 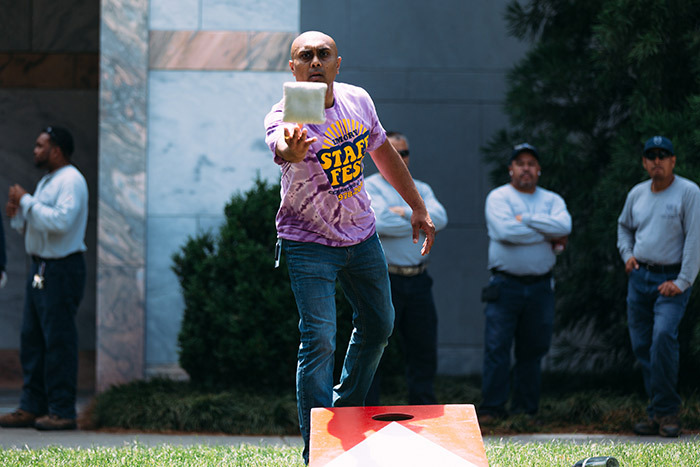 On the opposite end, homegrown teams engaged in friendly battle on an outdoor volleyball court, while nearby fleet-footed staff members joined in line dancing and Zumba moves to music that often echoed nostalgic 1970s tunes. 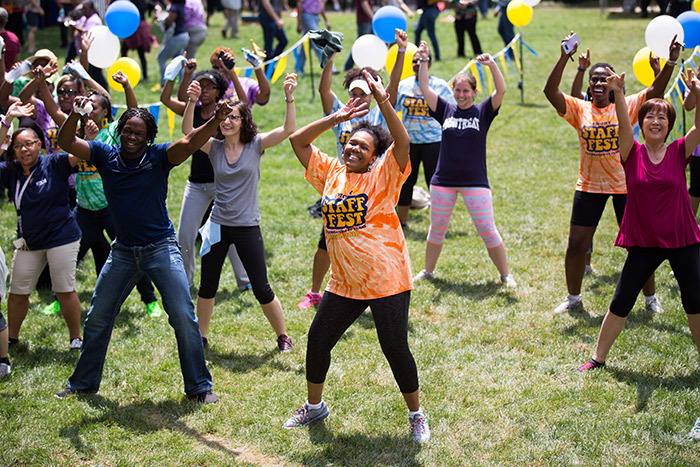 Like the intermittent sunlight that flitted across the Quad, the crowd drifted here and there, projecting a light-hearted mood that often felt more like a family reunion than a corporate picnic — administrative assistants found themselves chatting with medical students, laboratory technicians shared lunch tables with Campus Life employees, and Campus Services staff faced off against School of Medicine employees on the volleyball court. 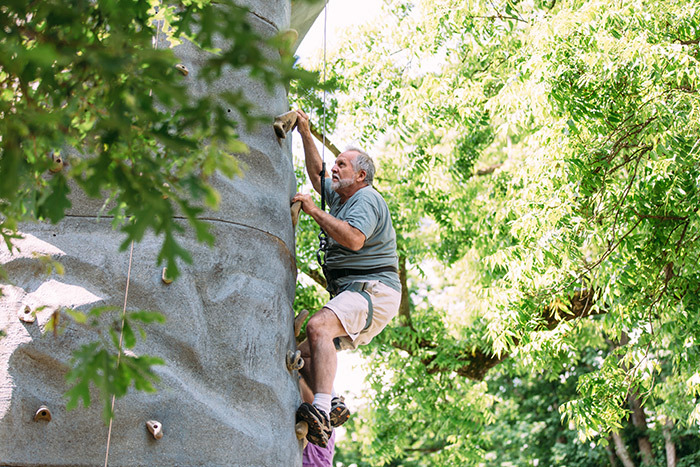 Amid a happy, relaxed setting, Emory staff members visited with one another, climbed an outdoor rock wall attraction, played Twister on a giant inflatable board, did good-natured battle over corn hole boards, sat for caricature drawings of themselves, and dressed up with props for goofy selfies. 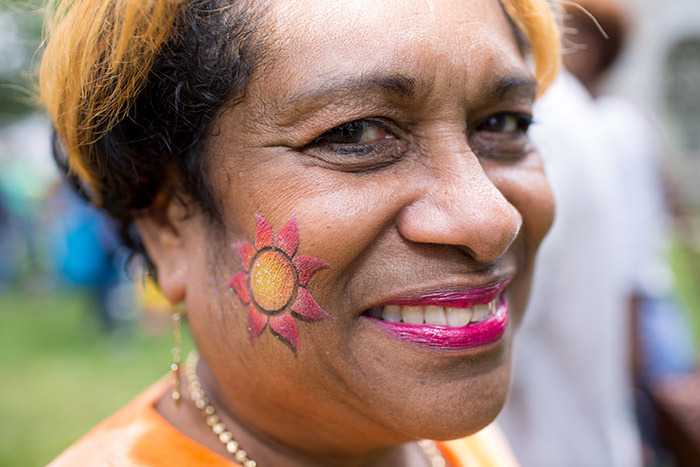 Human Resources recruitment specialist Janice Parmer, a 25-year volunteer at the First Aid tent, was enjoying a quiet day in the shade. 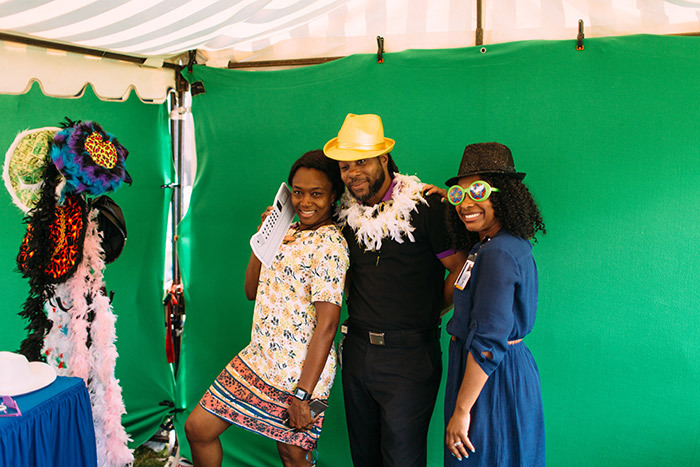 She was joined by Deborah Fotsch, registered nurse with Emory Healthcare, who was using the opportunity to encourage attendees to sign up for Emory Health Connect. “You can find out about so many benefits in one place,” Fotsch said. 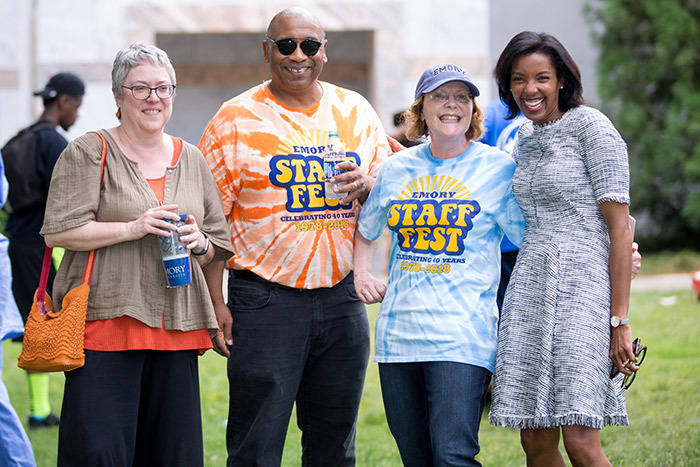 The Fun Run/Walk took place before the main Staff Fest event. 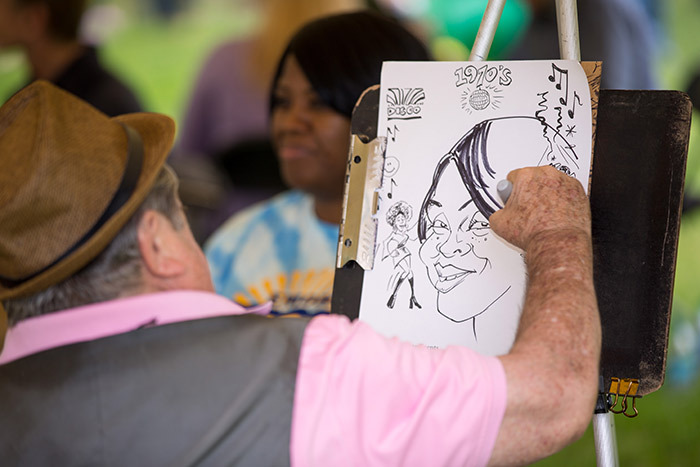 It began at 10:30 a.m., taking a two-mile route from Asbury Circle to the Quad. 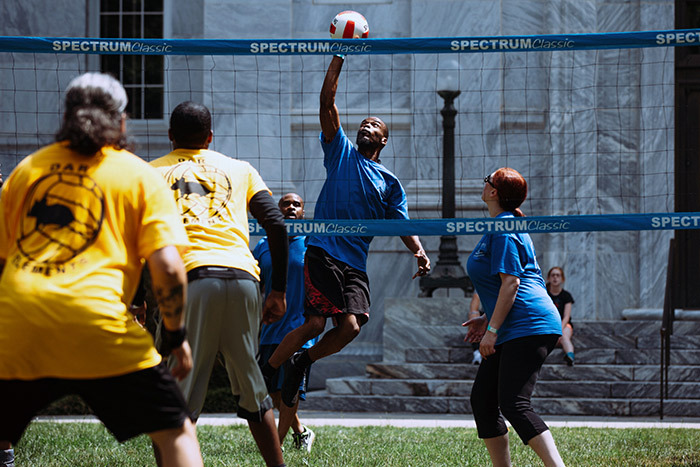 The volleyball tournament, a favorite at Staff Fest, drew 16 registered teams to the Quad this year for competition.